“The sword of the Spirit, which is the word of God” (Eph. 6:17). A sword is not armor but Paul included it because without an offensive weapon, even the most heavily armored person can fall. It is difficult to withstand attacks without being able to deliver your own, whether in offense or defense. The sword represents the Spirit and the word of God. The Lord stated in the latter-days, “Behold, I am God; give heed unto my word, which is quick and powerful, sharper than a two-edged sword, to the dividing asunder of both joints and marrow; therefore give heed unto my words” (D&C; 6:2; 11:2; 12:2; 14:2). A key addendum to this verse is also found in the Doctrine and Covenants: “Open ye your ears and hearken to the voice of the Lord your God, whose word is quick and powerful, sharper than a two-edged sword, to the dividing asunder of the joints and marrow, soul and spirit; and is a discerner of the thoughts and intents of the heart” (D&C; 33:1; emphasis added). Thus, the sword of the Spirit helps us discern the thoughts and intents of others. There are numerous examples of this in the Book of Mormon. One such example is Alma and Amulek. They understood and confounded Zeezrom with the Spirit and the word of God. The Savior always understood what the Pharisees and scribes were thinking; He knew their intents. This is why the Spirit is a weapon; through the Spirit we can reveal falsehoods in others and defend our testimonies against their attacks. We can expose their intents and confound them with the word of God. The truth pierces the soul and severs lies. The Spirit acts as a powerful testifying force, cutting to the heart of those with ears to hear. Throughout the scriptures we find other “spiritual clothing.” Isaiah mentioned a couple articles of clothing in chapter 61: “I will greatly rejoice in the Lord, my soul shall be joyful in my God; for he hath clothed me with the garments of salvation, he hath covered me with the robe of righteousness, as a bridegroom decketh himself with ornaments, and as a bride adorneth herself with her jewels” (Isa. 61:10; emphasis added). We should wear garments of salvation, clothing that is pure, clean, and worthy of and representative of the covenants we make with God. Latter-day accounts of Heavenly visitors often include descriptions of the visitors wearing bright white robes (e.g., JS-H 1:31). As Isaiah stated, the robes represent and reflect righteousness. Isaiah also stated that our scarlet sins can be white as snow (Isa. 1:18) through repentance and through the redeeming blood of Christ. The whiteness of the robes represents purity, holiness, and righteousness. The great Book of Mormon teacher Jacob taught about the Final Judgment: “We shall have a perfect knowledge of all our guilt, and our uncleanness, and our nakedness; and the righteous shall have a perfect knowledge of their enjoyment, and their righteousness, being clothed with purity, yea, even with the robe of righteousness” (2 Ne. 9:14). Now returning to the Isaiah verse quoted before, I think it is significant that Isaiah compared putting on the robe to a bridegroom and bride preparing themselves for marriage. All the ornamentation that we need, all that is truly precious, is a robe of righteousness. This is especially true in context of the numerous scriptures in the Book of Mormon where the wicked were known for wearing and being so enthralled with “fine-twined linens” (see 1 Ne. 13:7-8; Alma 4:6). What is it about clothing and wickedness? It’s not the clothing per se, it’s the pride that people have in wearing nicer clothes than others. It’s possible to be righteous and wear beautiful clothing (see Alma 1:29) just like it’s possible to be righteous and wealthy. However, pride and selfishness so readily follow such blessings. It’s like Tevye in the musical Fiddler on the Roof who sings “If I were a rich man.” While meant to be somewhat humorous, he wants to be rich so he wouldn’t have to work hard, could see his wife strutting around like a peacock putting on airs, and have others see him spend so much time with the Rabbi and other learned men. There is a difference between the humble followers of Christ putting on their robes of righteousness and garments of salvation and the worldly wicked in the great and spacious building arraying themselves as peacocks in their gaudy garments of wickedness. I pray that we will decide to wear spiritual clothing worthy of who we are as children of God. We should protect ourselves with the armor of God and join the fight against sin. Have “your feet shod with the preparation of the gospel of peace” (Eph. 6:15). Elsewhere the Lord has said, “If ye are prepared, ye shall not fear” (D&C; 38:30). As we prepare ourselves spiritually, physically, mentally, and emotionally we can better withstand temptations and other things that would lead us away from doing that which is right. When we are prepared we are able to go where and when the Lord will have us go. With what are we prepared? The gospel of peace. It brings peace to our lives and we can use our feet to spread that peace to others as so many LDS missionaries can attest. “Above all, taking the shield of faith, wherewith ye shall be able to quench all the fiery darts of the wicked” (Eph. 6:16). In battles, the Roman shield was of key importance. It served to protect most of the body while allowing the legionnaire the attack his enemy. The soldier moved his shield around to ward off blows and even attack the enemy, if necessary. 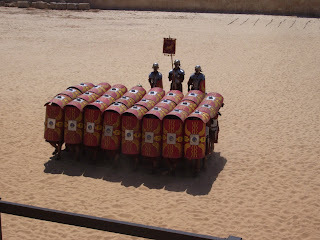 If the armies were farther apart, such as at the beginning of a battle, then small groups of legionaries would often make a testudo, or tortoise, formation in order to protect themselves from arrows. The legionaries in front or on the edges crouched behind their shields, blocking attacks from front. Those behind or in the middle held their shields over their heads and the heads of those in front. This formation was slow but very strong and could withstand serious firepower from the arrows of enemy archers. In general, soldiers could withstand more and stronger attacks as a group than they could individually. Why did Paul say that the shield of faith was most important? Faith in the Lord Jesus Christ is the first principle of the gospel. It is the foundation of the gospel; all other things build upon it. Faith is a shield; it can protect us from onslaughts by the Adversary. It also is stronger when combined with the faith of others – we stand stronger together than we do alone, which is one reason it’s important to attend church and be an involved part of a ward. “Take the helmet of salvation” (Eph. 6:17). Helmets protect the head and brain. Head injuries are usually very serious with the highest rates of fatalities and disability of any injury. The brain controls everything we do. What should we be doing with our brain, how do we protect it? The next verse provides the answer: “Praying always with all prayer and supplication in the Spirit, and watching thereunto with all perseverance and supplication for all saints” (Eph. 6:18). We should pray always. We should pray not just for ourselves but also for others. Prayer is our method of communication with our Heavenly Father. Through prayer and the spirit and the grace of God we are led to salvation. If we pray for strength and greater faith (which we should) we should always remain humble and ever-reliant on the Lord. As C.S. Lewis once said: “Meanwhile, little people like you and me, if our prayers are sometimes granted, beyond all hope and probability, had better not draw hasty conclusions to our own advantage. If we were stronger, we might be less tenderly treated. If we were braver, we might be sent, with far less help, to defend far more desperate posts in the great battle.” (Source). However, as we are faithful, wearing our helmets of salvation, the Lord will be with us just as He was with David facing Goliath or Joshua and his army facing Jericho. When we keep the goals of salvation and exaltation in mind, we do not let anything distract us from doing what is right. With a helmet of salvation we keep our thoughts pure and Christ-centered. Those who are faithful will, in the next life, replace their helmet of salvation with a crown of knowledge (Prov. 14:18), righteousness (D&C; 29:13), glory, honor, immortality, and eternal life (D&C; 75:5). Link to the 1st part of this post. Clothing is used symbolically numerous times throughout the scriptures. The most well-known example is found in Ephesians 6. “Put on the whole armor of God, that ye may be ale to stand against the wiles of the devil” (Eph. 6:11). Elsewhere Paul referred to this armor as the “armour of light” (Rom. 13:12). The Roman Empire was in control of Israel at the time. The armor Paul was referring to was likely that of the Romans, with which all Israelites were quite familiar. Paul states: “Stand therefore, having your loins girt about with truth” (Eph. 6:14). This piece of armor that helped protect the loins (which is the area from the lower abdomen – including the intestines – down to upper thighs) was likely what is called an apron; for a Roman soldier, an apron was a piece of armor that hung down below the breastplate, protecting the loins. It was part of (or at least held in place by) their balteus (sword belt). In the garden of Eden, Adam and Eve made themselves aprons because they were ashamed of their nakedness after they ate some of the fruit of the tree of knowledge (see Genesis 3:7). The apron was the first article of clothing made on this earth; it covered the loins of Adam and Eve. Just as they wore aprons once their eyes were opened to the truth, so should we gird our loins with truth. When we know the truth, we put off the natural man and woman and follow the law of chastity. There is also a “breastplate of righteousness” (Eph. 6:14). The breastplate protects the torso – which houses most of the vital organs. It is the largest and one of the most important pieces of armor. It covers the lungs, which provide the breath of life, and the heart, which provides the blood of life. We wear this armor when we let our every breath and heartbeat be filled with righteousness. We wear this breastplate when we strive to live like Him who provides us with life, physical and spiritual. We wear this breastplate when we turn our hearts to the Savior, who shed His blood for us. We wear this breastplate when we repent, washing our crimson garments in the blood of the Lamb.